Did you know that due to budget cutbacks, almost all trail maintenance is currently being completed by volunteers? CORBA members have given thousands of hours to the mountains by building new trails and maintaining existing ones. Although the work can be exhausting, it is a rewarding feeling to ride a trail you've helped build and or maintain. Organized by CORBA - Available to everyone! You do not have to be a CORBA member or even a mountain bike rider to join us. Everyone is welcome. No experience is required. Each session begins with a review of safety procedures and use of the tools. We will provide the tools and training. 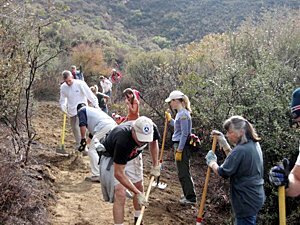 In conjunction with California State Parks, the National Park Service, Conejo Open Space and Conservation Agency (COSCA), the National Forest Service, the Santa Monica Mountains Conservancy and the Santa Monica Mountains Trail Council (SMMTC), we generally organize at least one work day per month. Dates are selected in advance so you can mark your calendar. Check back with us periodically. Work times are usually 8:30 am - 2:30 pm. Rain Policy: Heavy rain cancels - drizzle and/or rain the previous day does not! If you want to learn more about how to do proper trail building, repair and maintenance please see our Trail building and maintenance videos page. The CORBA Trail Crew had expected to begin construction of the new Mt Hillyer trail, but the environmental review, delayed several years by the Station Fire, has yet to be completed. This trail will include many technical features like drops, teeter-totters and ramps. See the Mt Hillyer Project page for details. A few CORBA volunteers helped the Santa Monica Mountains Trails Council with trailwork in Calabasas. View the photo gallery here. During a joint work day with SMMTC, we worked mostly on the lower third of the trail to remove the outside berm that was channeling water down the middle of the trail, forming a rut. View the photo gallery here. CORBA joined other user groups to work on COSCA's Hidden Meadow trail. We rerouted a large section of the trail. The trail work was followed by a barbecue and a raffle. View the photo gallery here. We took a crew down the Silver Moccasin Trail below Shortcut Saddle. We made some good progress. See the animated photo at right. 2007-03-13: Reino Trail off Reino Road in Newbury Park. As of our last joint work day on this trail with the SMMTC the trail is now complete. It connects Reino Rd in Newbury Park with Via Las Brisas in Dos Vientos, across the street from the a connector to the Sierra Vista and Pool View Trails. View the photo gallery and video here. View map. We cleared out the brush and widened the trail, mostly near the big oak tree. View the photo gallery here. IMBA Trail Crew members Nat and Rachel visited for a couple of days. On Friday night they gave a presentation on IMBA's activities to support trail building. On Saturday, we extended the roughed-out Reino Trail, more than doubling the length of finished trail. View the photo gallery and video here.